Bren Smith is one of the world’s most sustainable, ethical, and productive farmers. His farms have tiny footprints with massive outputs, and they’re open to public exploration and recreation. The crops he grows have the capacity to consume up to five times the amount of carbon that traditional farm plants consume. The key to Smith’s success? Everything he cultivates lives underwater. Thimble Island Ocean Farm is one of the first “3D” ocean farms on the planet. Smith’s innovative vertical underwater gardening technique has made high yields on minimal acreage a reality, while his attention to biodiversity—he farms shellfish in addition to a whole host of healthy, fast-growing sea vegetables—is restoring ocean ecosystems and creating biofuel. Believing that Thimble Island could provide a blueprint for a new ocean economy, Smith open-sourced his model. 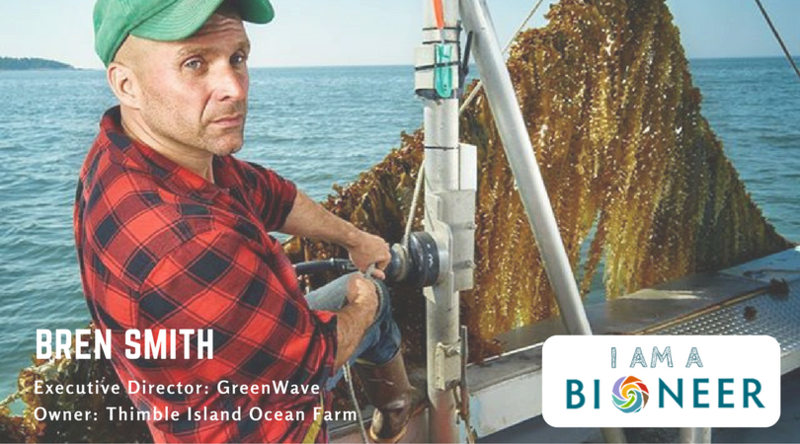 Today, his GreenWave organization helps would-be entrepreneurs start their own ocean farms, providing new employment avenues for those left behind by unsustainable industrial economies. Watch Bren Smith tell the story of his transformation from deep-sea fisherman to sustainable economy pioneer in this video from Bioneers 2016, and read the transcript that follows. My story is a story of ecological redemption. I was born and raised in Newfoundland, Canada, dropped out of high school when I was 14, and headed out to sea. I fished the Grand Banks and the Georges Banks—tuna, lobster. I headed out to the Bering Sea in the 80s and fished cod and crab. Now, this was the height of industrialized fishing. We were tearing up entire ecosystems with our trawls, chasing fewer and fewer fish further and further out to sea. And most of the fish I was catching were going to McDonald’s for their fish sandwich. I was a kid producing some of the lowest, worst, most destructive food on the planet. But God, I loved that job. The sense of humility of being in 30-foot seas; the sense of solidarity being in the belly of a boat with 13 other people doing 20-hour shifts; and the sense of meaning, of helping feed my country. Those were some of the best days of my life. I’ve been on the water for 30 years, and I miss them so, so much. Then the cod stocks crashed back home in Newfoundland. This was a real wake-up call. Thousands of fishermen thrown out of work, boats beached, canneries emptied. It is amazing that a culture and economy built up over a hundred years can disappear in a matter of weeks in the face of ecological crisis. That’s when I began to learn that ecological crisis has nothing to do with the environment, it has to do with the economy. There will be no jobs on a dead planet. So, I started this search for sustainability, and I ended up in the aquaculture farms in Northern Canada, because aquaculture was supposed to be the great answer to over fishing, job creation, and reduction of pressure on fish stocks. Instead, it was more of the same. We were polluting local waters with antibiotics and pesticides. We were growing neither fish nor food. These were Iowa pig farms at sea. I kept searching, disillusioned, and I ended up in Long Island Sound. I chased a woman down there. They were opening up shell fishing grounds for the first time in 150 years to attract young fishers back into the industry. I remade myself as an oysterman. I did that for a couple years, and then the storms hit— hurricane Irene, hurricane Sandy—barreling through, wiping out 90 percent of my crop. Most of my gear washed out to sea two years in a row. Suddenly I found myself on the front lines of a climate crisis that arrived 100 years earlier than expected. This was supposed to be a slow lobster boil. It’s here and now, as everyone in this room knows. Facing ecological collapse means I can’t work on the water. The goal in my life is to work on the sea. My goal is to die on my boat one day. That’s going to be a measure of success. But we need to protect and save the oceans for me to die that way. I picked myself up and started redesigning my farm. I lifted it off the bottom so it was resilient to storm surges, used the entire water column and searching for new species to grow—species that were restorative. After 15 years of experimentation with sustainability, I ended up as the first 3D ocean farmer, growing a mix of seaweeds and shellfish to create good local food, create jobs, and help fight the climate crisis. Now, let’s look at the farm, because it’s hard to picture what I’m doing under the water. I had a kid draw this picture, and it’s really simple. It’s just hurricane-proof anchors on the edges of the farm and then a rope eight feet across the surface. From there, we grow our kelp vertically downward. Next to that, we’ve got our scallops and lantern nets, muscles and muscle socks. On the bottom, we have oysters in cages, and then clams down in the mud. Here’s a picture of our kelp. Beautiful plant. So, kelp grows in post-hurricane season, and it’s one of the fastest-growing plants on Earth. Once we harvest the kelp, the muscles set. We have mini-scallops and then we’ve got our oysters, which are thimble island salts. It’s like a splash of ocean when you eat it. Here’s the picture of the farm from the surface. I run eco tours—$500 to come out. It’s the biggest rip-off in the tourist industry, because there’s nothing to see. But that’s such a good thing, right? It has a low aesthetic impact. Our oceans are these beautiful pristine places and we want to keep them that way. Our farms have small footprints. My farm used to be 100 acres. It’s down to 20 acres, and I’m growing way more food than before because we’re vertical. Anybody can boat, swim and fish on our farms. They’re community spaces where you can dive through our kelp forests. We don’t own the property. All we own is the right to grow shellfish and seaweeds. We own a process not a property. We’re going to farm to protect our commons rather than privatize it like agriculture did. Our goal was to take on three major challenges. One was develop a delicious new seafood plate in this era of overfishing and food insecurity. We reject agriculture’s obsession with monoculture. We grow for polyculture. Sea bass, two kinds of seaweeds, four kinds of shellfish, and we harvest salt as well. But we’ve barely broken the surface. There are 10,000 edible plants in the ocean, and a couple hundred shellfish. I mean, imagine being a chef at this time and finding out there are arugulas, tomatoes, and rices that you’ve never cooked with before, tasted or seen. This is an exciting time to develop a culinary cuisine. What we’re going to do is re-imagine a seafood plate. We’ll move bivalves and sea greens to the center, and wild fish to the edges. Our kelp is the “gateway drug” to de-sushify sea greens. We’re making kelp the new kale by doing barbecue kelp noodles with parsnips and bread crumbs. These are vegetables. This isn’t seafood. We’re doing sea green butters and umami bomb bullion cubes. Our new ocean dinner, it’s going to be fun, it’s going to be creative, and it’s going to be delicious. It’s time to eat like fish, because fish don’t make omega 3’s and all these things we need—they eat them. By eating like fish, we get the benefits while reducing pressure on fish stocks. This isn’t some little boutique, like bearded Brooklyn bee farm. 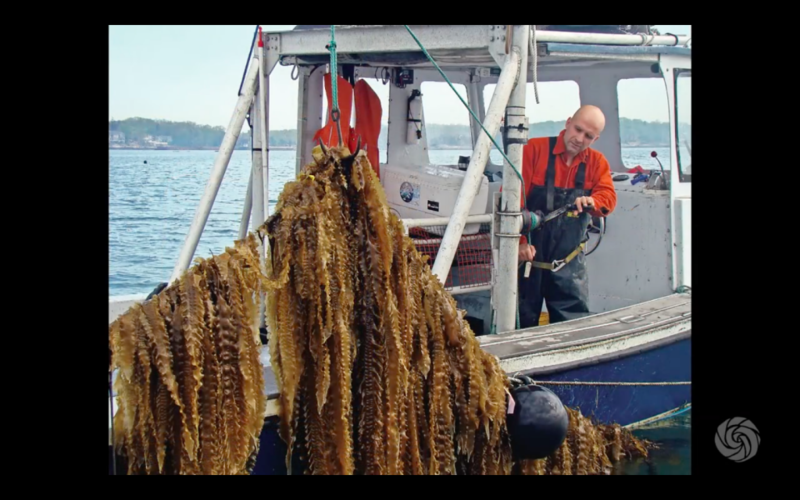 We can grow huge amounts of crops in small areas—10 to 30 tons of seaweed, 250,000 shellfish per acre. If you were to take a network of our farms totaling the size of Washington state, you could feed the world. And this is zero-input food. It requires no freshwater, no fertilizer, no feed, no land, making it hands-down the most sustainable form of food production on the planet. In the era of climate change, as water prices and feed/fertilizer prices go up, our food is going to be the most affordable food on the planet to grow, and the most affordable food on the planet to eat. We are going to be eating sea greens. Climate change is going to force us to eat zero-input foods. Question is: Is it going to be delicious, or is it going to be like being force-fed cod liver oil? That’s where the chefs come in. If chefs can’t make what we can grow delicious, they should quit their jobs. Developing this climate cuisine is what they’re here on Earth to do. The second goal of the farm is to transform fishers into restorative ocean farmers. Mother Nature created these two technologies millions of years ago, designing them to mitigate our harm: shellfish and seaweeds. Oysters are these incredible agents of sustainability that filter out 50 gallons of water a day, pulling nitrogen out of our water column, which is the root cause of dead zones spreading through the globe. Our kelp soaks up five times more carbon than land-based plants. It’s called the sequoia of the sea. We can turn it into zero-input biofuel—2,000 gallons per acre of ethanol. If you take an area the size of Maine, you could replace all the oil in the United States, according to the Department of Energy. The New Yorker recently called it the culinary equivalent of the electric car. Our farms also function as storm surge protectors. Now that our coral reefs or oyster reefs are gone, our farms replace them. There are artificial reefs attracting over 150 species that come hide and thrive. My farm used to be a barren patch of ocean, and now it’s a thriving ecosystem. As fishermen, we’re now climate farmers. Restoring rather than depleting, and really trying to tackle, in our own small way, the climate crisis we all face. We’re also trying to use our zero-input crops to replace land-based inputs. We’ve got a program with the Yale Sustainable Food Program to use our kelp as fertilizer in their organic farm. As the nitrogen leaches off back into the waters, we capture it and close that nitrogen loop. Cattle have been eating kelp for hundreds of years, until industrial feed pushed it off the farm. If you feed cattle a majority diet of kelp, you get up to a 90 percent reduction in methane, and you get this beautiful tasting, umami-filled beef. It’s delicious stuff. When we bring this stuff into New York, I’m going to blow grass-fed beef off the table. The idea is really to build a bridge between land and sea. Too often, our thinking about the food system stops at the water’s edge. I go to food conferences. There are maybe 1,000 people, and there’s this little break-off session about the ocean, and eight people attend. That’s why I’m absolutely frightened. The last piece is building a foundation of a new economy that puts jobs, justice, and restoration at the center of the plate. Now, I’m not an environmentalist. I kill things for a living. You give me a gun, I’ll shoot moose out of my kitchen window. I grew up with seal hunts. And I wouldn’t be doing this unless it created jobs for the 40 percent of people that are unemployed in my community—unless it created opportunity for the millions of people that were left behind as we built the polluting industrial economy. That’s why I’m here. We built Greenway, which is a hybrid nonprofit/for-profit, to begin building this industry from the bottom up. We work to replicate and scale. We build the infrastructure necessary, and we develop new markets. First thing we did was open-source our model. We don’t franchise. That’s a tool of the old economy. In a new economy, we make things accessible to everybody. Anybody with 20 acres and a boat and $30,000 can start their farm and be up and growing the first year. The key to replication is designing around simplicity, not complexity. Our farms require minimal capital costs and minimal skill. Think of it as the nail salon model of the sea. And they’re profitable. Because we don’t have to feed and weed these things, we’re able to net up to $200,000 or $300,000 per farm and employ up to 10 people, and that’s just on the farm, that doesn’t count the processing centers. As a farmer, you get some start-up grants. We give free seed, and we’re keeping the hatchery under the nonprofit side, because three companies own 53 percent of the land-based seed supply, and seed is the most expensive input for farmers. We’re going to look at our system and decide where profits can be extracted and where can’t they. They’re not going to come off the backs of new ocean farmers. We get gear from Patagonia, and we guarantee purchasing. It’s hard to farm in the era of climate change and globalization. We guarantee to buy up to 80 percent of farmers’ crops for three to five years at triple the market rate. We’re going to give people a stable platform so they can learn to grow. We have requests flooding in. We’ve had requests to start farms in every coastal state in North America and 40 countries around the world. We have land-based farmers—young ones—just flooding in, because they can’t afford land. We also have our first farmer here in California who’s a Mexican American, second-generation plumber, and I’m really hoping is going to be the new face on the West Coast, so I never have to fly here again. We’re also building a land-based infrastructure to scale. We have the largest hatchery network in the U.S., and we’re building seafood hubs so farmers can capture more of that value chain. Our land-based infrastructure is designed to be an engine of food justice—a place where we embed good jobs and food access into the DNA of the new ocean economy. In practice, this means placing our seafood hubs in communities that need it most. Our first one was in one of the poorest neighborhoods on the East Coast. Our starting wages are minimum $15 an hour, and it’s open employment, so don’t you dare bring your resume. I don’t care if you’re a former felon or undocumented worker, we’re going to figure out a way to work together. This isn’t just about jobs. This isn’t about working in our processing factories. This is about agency. One of the major deficits in our society today is the feeling that you can make a difference—that you have to be an Amazon, you have to be a Google, in order to tackle the big problems. You don’t. Our goal is to make sure the folks who were left behind from the old economy own their own farms, that they don’t have bosses, that they have self-directed lives. Giving people agency over their lives is a core value of this new ocean economy. The last piece of the Green Wave program is innovation and market development. We’re developing new technologies for solar, harvesting boats, mobile hatcheries, data sensing. Data sensors make it so we can do pollution farming in places like the Bronx and measure our ecosystem services. We can use it not for the food system but for biofuels, because kelp is the soy of the sea, except for it’s not evil. The market power is that it has so many uses in so many sectors. If you put this together, everybody asks me what does scale look like. It’s not thousand-acre banana plantations. It’s networks of 25 to 50 farms in a local region—a seafood hub, a hatchery on land, a ring of big institutional buyers (hospitals, colleges, companies like Google), and then a ring of entrepreneurs developing value-added products and doing the innovation. We take those Green Wave reefs and we replicate them every 200 miles. You see a Home Depot, we’re going to have a Green Wave reef right on top of it. Offshore, we want to embed our farms in wind farms. Why just harvest wind? We have that structure, let’s do food, fuel, and fertilizer in those same spaces. Our oceans are huge places. There’s a lot of room to play, as long as we do it the right way. To close, turning Green Wave’s vision into reality, I think, is a necessity. The land-based ag systems is entering these cycles of escalating crisis. Climate change is expected to drive up corn prices up to 140 percent in the next 15 years. It is terrifying, the carbon and methane output from the ag sector. You throw in population rise, growing inequality in the U.S. and around the globe, and food insecurities emerging as the new normal, and if that’s not enough, farmers can’t even make a living—91 percent of farmers in the U.S. lose money year after year. This is just a system that’s not working. Climate change is going to force us into the ocean. I think that’s one of the real lessons of the droughts out here in California—we’re going to be forced out to sea. But our wild fisheries can’t handle it—85 percent of wild fish stocks are over-harvested, and we just can’t expect our fish to bear that burden. This is all what’s so exciting: Climate change, at least out on the water, is breeding hope for those of us that are out there on our boats. Because this is our chance to do food right. For the first time in generations, to build an agricultural system from the bottom up. Our oceans are these blank slates. More of the U.S. is under water than above. This is our opportunity to protect rather than privatize our oceans, our seas, ensure beginning and low-income farmers have access to low-cost property, avoid all the mistakes made in industrial land-based ag and industrial aquiculture. Let’s invent whole new occupations to feed the planet and lift communities out of poverty. This is the new face of environmentalism. It’s not just conservation and stopping pipelines. We have to do that, that is great stuff, but it’s also about building alternative visions. It’s about fighting climate change by creating jobs, and giving people meaning and agency. Wouldn’t that be a beautiful environmental movement, if we were pushing for that? We could be building an economy of food and work, where fishermen like me are proud to write songs about it. We can create something so beautiful, so powerful and restorative out at sea. And we can eat together, we can work together, and figure out how to make a living on a living planet.